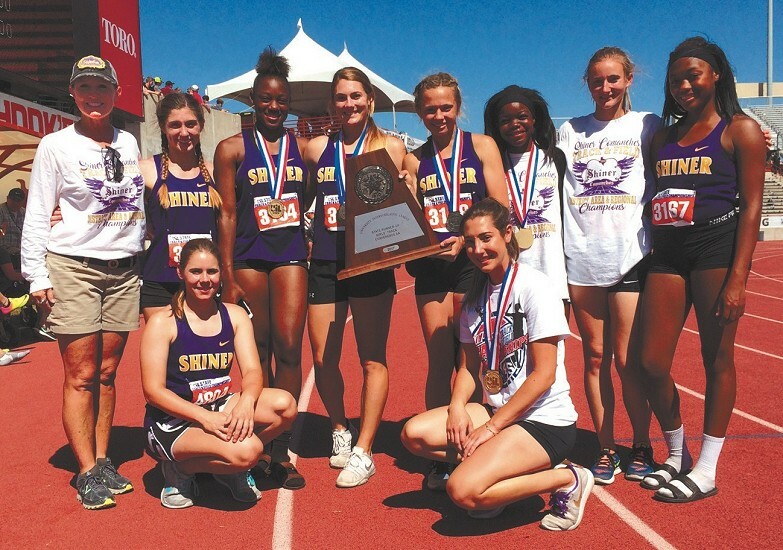 The Shiner girls team finished second in the 2017 Class 2A UIL Track and Field State Championships ( at Mike Myers Stadium at The University of Texas in Austin on Saturday, May 13, 2017 ). Team members are (left to right): Front row kneeling, Jenna Berkovsky, Bailey Machacek; Back row standing, Coach Cece Oden, Faith Wagner, Rashel Bonds, Kassidy Bishop, Mackinly Pilat, Charisma Thomas, Kayla McCarthy and Kyondra Miller. AUSTIN - Refugio's Alexa Valenzuela hasn't always left a track meet in the best of moods. The same could be said for the entire Shiner girls team. Valenzuela and the Lady Comanches have faced their share of adversity this season. But they showed the ability to bounce back on a sunny Saturday at Mike A. Myers Stadium. Valenzuela won a gold medal in the Class 2A 200-meter dash and a silver medal in the 100 at the UIL Track & Field State Championships. Shiner scored points in a number of events to finish second in the team standings, after sharing the championship last season. Valenzuela and the Lady Comanches highlighted Saturday, which saw area athletes capture 18 medals, including three gold, 10 silver, and five bronze. Valenzuela did not like the way she started the meet with a fourth-place finish in the long jump Friday. But the sophomore did her best to temper her frustration before returning to the track for her running events. "I had three more events to do," Valenzuela said. "I had three chances to get gold and I had to get it out of my head because if not, I would have eaten myself up. I would have been down all day today." Valenzuela got on the right track after finishing second in the 100. "I was very pleased," she said. "Once again, I just came back from an injury, and it was my first time running it. I was amazed I got second. I came in third and got second." Valenzuela ran the anchor leg on the 800 relay and almost made up a huge deficit before finishing fourth. "I wanted my team to get the feeling of being on the podium because I was there last year," Valenzuela said. "I felt amazing and I wanted them to feel that. It was right there, but it was too far." Valenzuela left no doubt by winning the 200 for the second straight year. Shiner's Mackinly Pilat clears a hurdle in the 300-meter hurdles during the UIL Track and Field State Championships on Saturday ( May 13, 2017 ). Pilat won the silver medal in the event. "I told myself, 'It's your last race. Go all out. Win or lose, you're here.'" Valenzuela helped the Lady Cats score 40 points to finish third behind Shiner and ran her medal count to five. "That's the thing with her," said Refugio coach Katie Green. "As an athlete who wants to run in college, she needs to know that not every year is going to be the same. There are always going to be different circumstances in what's going to happen to you. She got a good taste this year." The Lady Comanches' chances to repeat as team champion all but disappeared when the 800 relay team dropped the baton in the preliminaries of the Region IV-2A meet. But they won the 400 relay and Mackinly Pilat earned a silver medal in the 300- meter hurdles after Kassidy Bishop claimed a bronze medal in the triple jump Friday to finish with 47 points, nine shy of team champion Gladewater Union Grove. 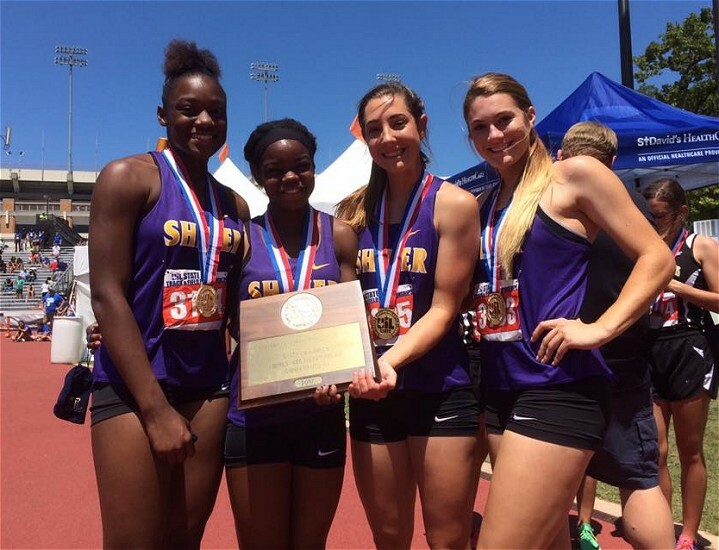 "After regionals, we were short a relay," said Shiner coach Cece Oden. "We regrouped and every girl thought they could contribute. I said if everybody could get us points, we'd have a chance and they believed it. Everybody contributed, and that's all I can ask." Pilat did her part by earning her first state meet medal after battling hamstring issues last season. "It feels really awesome," Pilat said. "I worked really hard. I'll go out every weekend practicing, and it's good to be rewarded for it." Van Vleck's De'Mitri Monroe, Goliad's Ricky Waer and Rice Consolidated's Riley Schneider and Ryan Trahan won multiple medals. Monroe, a sophomore, claimed a silver in the Class 3A 100 after losing the gold in a photo finish, and earned bronze medals in the 400 relay and long jump. "Competing at the state meet is the best you can have," he said. "You have a lot of people watching you and cheering you on. I had good races and I like competing with people." The Shiner girls team claimed the gold medal after winning the Class 2A 4x100m Relay at the 2017 Class 2A UIL Track and Field State Championships at Mike Myers Stadium at The University of Texas in Austin on Saturday, May 13, 2017. Relay team members, left to right, are: Rashel Bonds, Charisma Thomas, Bailey Machacek and Kassidy Bishop. Waer won silver medals for the second consecutive year by finishing second in the 110 and 300 hurdles. Waer, a senior who will run at Incarnate Word, missed out on a gold medal by 100th of a second. "I felt clean at the beginning," he said, "and then I let the size of the meet get to my head, and that's what cost me the race." 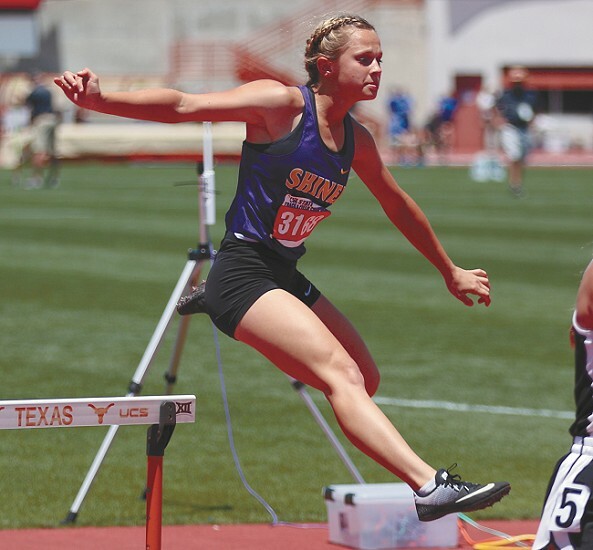 Schneider, a senior who will run at Texas A&M, earned a silver in the 100 hurdles and a bronze in the 300 hurdles. "I've been doing well this year," she said. "I've done so much better than last year. I hit my PR by the fourth or fifth track meet and ever since then, I've been getting better. I've been working a lot on technique and getting stronger and faster." Trahan, a senior who will run at Texas A&M, claimed a silver medal in the 3,200- meter run Friday and did the same in the 1,600-meter run Saturday. "I've come a long way in the last four years," he said. "When I started running, I was a nobody. I never had a chance to be here. I worked my way up to state and everything, and it wasn't supposed to end like this. It's a lesson that if I put my mind to something, I can accomplish things." The Cuero 800 relay team of Jordan Whittington, Bralen Taylor, Kiki Mack and Tre Miles turned in their best time of the season to win a Class 4A bronze medal. "After the 4 by 1," Miles said of the 400 relay which finished fifth, "I felt we could have pushed it more. On the 4 by 2, I said I was going to put us on the podium and do all I had to do for my team. "Our time of 1:27.04 is a blessing," he added. "We haven't busted 1:28 all year. To do it at state and PR by a lot, we just give thanks to the Lord." Schulenburg senior Josh Brown was able to successfully defend his Class 3A discus title, but not without some anxious moments. Brown scratched on two of his first three throws before getting the winning mark on his fifth attempt. "I was nervous. I was real nervous," said Brown, a senior who will throw at Texas A &M. "I think I was more nervous than last year to repeat. I think I was trying too hard to get one out there. I just had to slow things down a little bit and got a good one." Goliad came up short in its attempt to win Class 3A team titles, but brought home two medals in addition to the two Waer won, and the one Amaya Brown earned Friday. The girls 800 relay team of Reagan Berger, Roxanne Morris, Ashley Sulak and Brown captured a silver medal. "We're here in multiple events, and we were able to represent our school as good as we have with every competition we've been to," Morris said. "Being here at Mike A. Myers Stadium is just a really good atmosphere, and it shows just how hard we worked this year." Orion Hosey finished his senior season by winning the bronze in the 200. "If someone told me I was going to get a medal, it would have been in the 4 by 2 or 200," said Hosey, who will run at Texas Lutheran University. "I really had a lot of confidence coming out and doing well in those races." Rice Consolidated's Larissa Manciaz pushed herself to the limit in winning a silver medal in the Class 3A 400. She collapsed after crossing the finish line and was taken to the hospital as a precaution after suffering from dehydration. As a result, her teammates decided not to run the 1,600 relay. The Lady Raiders won a silver medal in the 400 relay. "I know we all put our heart out on the track," said senior Caitlin Ambeau. "All the hard work and killer practices that had us dying. But at the end of the day, I'm proud of these girls." Mike Forman is a sports writer for The Victoria Advocate. Contact him at 361-580-6588, or by e-mail at mforman@vicad.com.